Dimensions 0 by 8.25 by 10.25 in. Horse Speak is not a training method or techniqueâit is a practical system for âlisteningâ and âtalkingâ to horses in their language, instead of expecting them to comprehend ours. Horse Speak can be used by anyone who works with horses, whether riding instructor, colt starter, recreational rider, or avid competitor. It promises improved understanding of what a horse is telling you, and provides simple replies you can use to tell him that you âhearâ him, you âget it,â and you have ideas you want to share with him, too. The result? Time with your horse will be full of what horse trainer and equine-assisted learning instructor Sharon Wilsie of Wilsie Way Horsemanship calls Conversations, and soon the all-too-common misunderstandings that occur between horse and human will evolve into civil discussions with positive and progressive results! 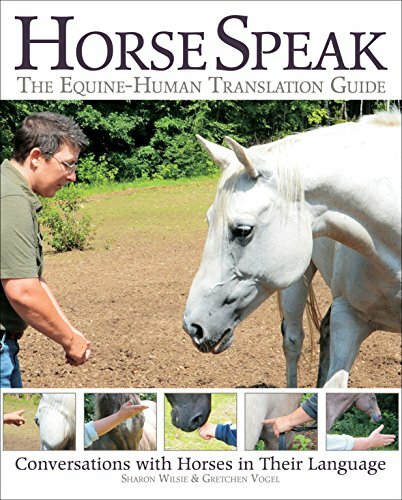 Learn Horse Speak in 12 easy steps; understand equine communication via breath and body language; and discover the Four Gs of Horse Speak: Greeting, Going Somewhere, Grooming, and Gone. Practice regulating your intensity, and sample dozens of ready-made Conversations with your horse, as step-by-step templates and instructional color photographs walk you through the eye-opening process of communicating on a whole new level. About: Horse Speak is not a training method or technique—it is a practical system for “listening” and “talking” to horses in their language, instead of expecting them to comprehend ours.